The S.C. Department of Natural Resources and Pee Dee Land Trust have announced the completion of a partnership conservation deal that will protect a 100-acre inholding of bottomland hardwood forest along the Great Pee Dee River in Marion County, within the state natural resource agency’s existing 5,600-acre Marsh Wildlife Management Area. The property acquisition was made possible through a wetlands mitigation agreement reached with CSX Transportation. Mitigation was a necessary component of the company’s plans to upgrade an existing wooden railroad trestle crossing the Great Pee Dee River downstream from US 378. According to a statement released by CSX, "Since this section of tracks carries daily freight traffic from the South Carolina Ports and other industries, CSX had to devise a plan to replace the bridge in sections, so rail traffic could move each day. This necessitated a temporary platform in the river swamp to do the bridge work, as well as a permit from the Charleston District U.S. Army Corps of Engineers." CSX contracted with Columbia-based environmental engineering firm AMEC-Foster Wheeler to coordinate property evaluation and permitting for the project. As outlined in the mitigation agreement, the addition of the new property will "connect this isolated private land with state-owned lands to create a contiguous wetland habitat corridor along the Great Pee Dee River." The agreement codifies the long-term protection of the 100-acre parcel known as the "King Tract," and will also "complete the protection of the confluence of the Great Pee Dee River and Mulyn Creek, a significant aquatic feature within the Marsh WMA." "In this case, the company is mitigating for a temporary loss of wetland function, rather than a permanent loss," said Greg Mixon with the S.C. Department of Natural Resources (DNR) Office of Environmental Programs. "Construction of an access road that will be removed after the work is complete will entail filling some wetlands at the site," Mixon said, "but the federal Clean Water Act, administered in South Carolina by DHEC and the Corps of Engineers, requires that even temporary wetland impacts be mitigated when the temporary fill remains in place for a longer period of time." The property will be a valuable addition to Marsh WMA for a number of reasons, said DNR Regional Biologist Sam Stokes Jr.
"We are excited that we have the property intact and as-is, because it's a continuation of the habitat that we already have on Marsh," said Stokes. "The main benefit it provides is that now we know for sure that this tract will remain intact into the future, which supports the continuation of our overall management goals for the property. 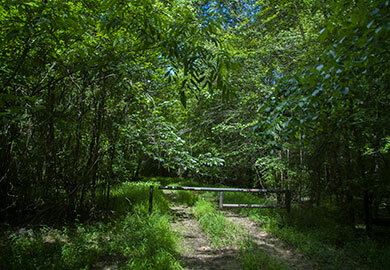 The existing road into the property will also provide a way for hunters, hikers and other people who want to use the property to access that part of it." This valuable addition to DNR's public lands program would not have been possible without the cooperation and assistance of Pee Dee Land Trust. "We were able to act as a placeholder to help bridge the gap and give DNR time to do the due diligence necessary to take ownership of the property," said Seth Cook, director of land conservation at the nonprofit. "The land trust's flexibility in being able to act as option-holder for DNR was a new type of support role for the land trust and allowed us to facilitate an important land conservation project in a different way." "We are always looking for opportunities to work with state agencies generally, and with DNR in particular, to pursue common conservation goals, and this project really accomplishes that" said Pee Dee Land Trust Executive Director David Harper. 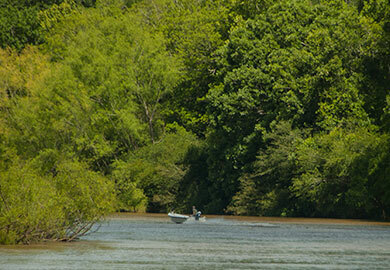 "This is a win-win for DNR and for the Pee Dee." "DNR is committed to partnering with the private sector, other state and federal agencies and non-government organization" said DNR Director Alvin Taylor. "This is another great example of working together to enhance and preserve the natural resources of our state and make more lands available for public recreation." Mitigation banking is the restoration, creation, enhancement, or preservation of a wetland, stream, or habitat conservation area which offsets expected adverse impacts to similar nearby ecosystems. The goal is to replace the exact function and value of the specific wetland habitats that would be adversely affected by a proposed project. The mission of Pee Dee Land Trust is to conserve, and to promote an appreciation of, the significant natural, agricultural, and historical resources of the Pee Dee Region of South Carolina. Pee Dee Land Trust has a toolbox full of options to help landowners who are interested in conservation such as accepting donations of land or conservation easements. More information at www.peedeelandtrust.org. With financial assistance from the Heritage Land Trust Fund, DNR purchased Marsh WMA in 2005 from the Marsh Furniture Company after having leased it from the company for 14 years. The property is comprised of 8,560 acres of bottomland hardwoods, upland pine, and mixed pine-hardwood forests. 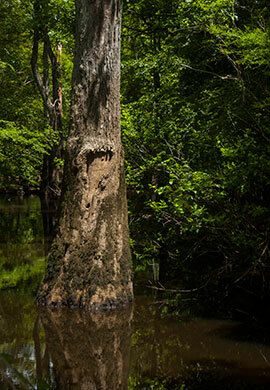 Marsh WMA is bordered by the Great Pee Dee River and Catfish Creek on the western side. The north end of the property is designated as the Special Use Area and is reserved for youth hunts conducted by the DNR Take One Make One Program each year. Over the past 75 years, the DNR has grown the WMA program from a 5,000-acre tract on the Savannah River in Hampton County to a massive, statewide collection of lands providing a wealth of public access. The DNR maintains a public hunting program on over 1 million acres of public land. Last year, more than 61,000 WMA permits were purchased for the purpose of hunting WMA lands. WMA lands are utilized not only for public hunting but for wildlife viewing, fishing, hiking, biking, paddling, photography, research, demonstration, education and a host of other uses.